Former Antisemitism Envoy Hannah Rosenthal promoting a “Walk for Israel” event in Milwaukee in 2017 (video below). As envoy, Rosenthal adopted a new, Israel-centric definition for antisemitism, and then used it to train U.S. diplomats. Now groups from the ADL to the Southern Poverty Law Center are disturbed that Trump isn’t filling the position. The Trump administration has failed to appoint an antisemitism monitor or staff the State Department’s antisemitism monitoring office, drawing fire from diverse groups that range from the Anti-Defamation League (ADL) and Israel lobbying organizations to Think Progress and the Southern Poverty Law Center. But the State Department Office to Monitor and Combat Anti-Semitism, and the “antisemitism envoy” who heads it, haven’t just been keeping tabs on anti-Jewish bigotry around the world. In reality, they have been monitoring international pro-Palestinian activism and promoting a crackdown on such activism in various countries. Meanwhile, the antisemitism envoy position has proved a revolving door to Israel lobbying organizations and activities. In addition, the report cited statements that connected Israeli actions to all Jewish people, reporting, for example, that some Kuwaiti columnists “often conflated Israeli government actions or views with those of Jews more broadly,” and “Swedish Jews were at times blamed for Israeli policies.” While it is incorrect and unfair to associate Israeli actions with all Jewish people, the report entirely omitted reference to the many Israeli leaders and pro-Israel organizations who promote this view, claiming that Israel represents all the world’s Jewish people. When Congress created the antisemitism monitoring office and envoy in 2004, the legislation included criticism of Israel among the “antisemitism” to monitor (although that inclusion was buried and not obvious in a quick read of the main legislation). At that time, the State Department declared publicly that such an office was unnecessary and would be a “bureaucratic nuisance” that would actually hinder the Department’s ongoing work against antisemitism. A State Department press release opposing the new office described the many actions the department was already taking against antisemitism. After the office was in place, the conflation of criticism of Israel with antisemitism grew incrementally, until it became part of the office’s official definition. The first antisemitism envoy, Gregg Rickman, endorsed an Israel-centric definition originally proposed by an Israeli government minister and disseminated by Israel partisans in Europe. After his term of office, Rickman went to work for the pro-Israel lobbying organization AIPAC (the American Israel Public Affairs Committee). After she left the envoy position, Rosenthal headed up the Jewish Federation of Milwaukee, where she worked on numerous activities supporting Israel, including promoting a Stand with Israel event (see her promotional video for the event here and below). The next envoy, Ira Foreman, also worked for AIPAC, and was instrumental in spreading the new Israel-centric definition to other nations. Indeed, Forman declared that “the United States pushed for a global definition of antisemitism” and that this “changed the global discourse on the issue” during an Anti-Defamation League press conference. The administration has indicated it may not fill these positions as part of budget cutting; out of 13 Special Envoy positions in the State Department, 8 are currently vacant (there is no Special Envoy to monitor and combat other forms of racism, for example against African Americans)***. Trump’s failure to fill the antisemitism positions has provoked an escalating bipartisan outcry by Congressional representatives and advocacy groups, amplified by certain media coverage and commentary. Among those pushing for Trump to fill the office are the Anti-Defamation League, the American Jewish Committee, various pro-Israel groups, diverse Congressional representatives supportive of Israel, and, more mildly, the liberal organizations Think Progress and the Southern Poverty Law Center. ♦ The American Jewish Committee says it engages in “pro-Israel advocacy at the highest levels.” It has also called for Trump to name an envoy and has created its own petition. ♦ The Southern Poverty Law Center then featured the Think Progress article about the State Department “abandoning the office” in its “Hate Watch Headlines.” The SPLC is often revered for its important work to oppose bigotry and hate, but it has praised Israel and been criticized for equating anti-zionism with antisemitism. Furthermore, its over $300 million operation has sometimes been brought into question as a cash cow that benefits from finding “hate” where it might not actually exist. The various advocates, as well as the Think Progress article, have cited an Anti-Defamation League report that antisemitism is on the rise, and fast. On the face of it, this certainly should be disturbing to anyone who supports equality and human rights. However, a number of groups have questioned the ADL report, and an ADL official admits that it is “not a scientific study.” The ADL report does not include a spreadsheet of the incidents it has included for independent researchers to examine, and it is unknown how many of the incidents may have been actually pro-Palestinian activism, but we do know that the “rise” included 2,000 hoax threats made by a young Jewish Israeli reportedly suffering from mental problems. ♦ Members of the House of Representatives’ Bipartisan Task Force Against Anti-Semitism initiated a letter in March calling on Trump to fill the position, another bipartisan letter was sent in June, and Democratic Senator Ben Cardin implored Trump to fill the “critical” position. Legislation was introduced into both the Senate and the House that would elevate the envoy position to ambassadorial level and would require even more detailed reporting than it is already doing. On June 26 the ADL organized a conference call with the media in which former envoys Hannah Rosenthal and Ira Forman called on Trump to fill the position, saying that “the envoy’s working definition of antisemitism helped U.S. personnel in foreign countries determine what is and is not antisemitism” — in other words, clarifying to them that they must consider various forms of criticism of Israel as antisemitism. Both Forman and Rosenthal say they expect Congress to fund the envoy’s office in the coming budget, and expect this will succeed in pushing Trump to appoint someone to the post. Unfortunately, given Trump’s failure to failure to reign in bigotry and antisemitism among some of his supporters, it may be unlikely that the new envoy will turn a focused attention to real cases of anti-Jewish bigotry. In fact, given Middle East advisor and son-in-law Jared Kushner’s support for rightwing Israeli settlers, as well as the Islamophobia embraced by elements of the Trump circle, the Trump administration could well move the office even more in the direction of suppressing support for Palestinian rights and criticism of Israel. Meanwhile, on July 3rd alone, Israeli authorities forced a Palestinian family to demolish its own home, Israeli forces rounded up 18 Palestinians in predawn raids, prisoners in Israel’s notorious Ktziot prison faced life-threatening conditions (40 percent of Palestinian males have cycled through Israeli prisons), and the Israeli military invaded and bulldozed land in Gaza. A typical day in Palestine. But don’t let the special envoy hear you say that. 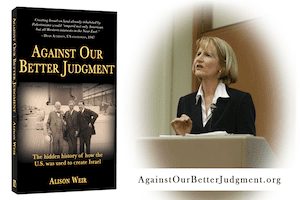 Alison Weir is executive director of If Americans Knew, president of the Council for the National Interest, and author of Against Our Better Judgment: The Hidden History of How the U.S. Was Used to Create Israel. Additional citations and information on this topic are in her recent report and timeline: “International campaign is criminalizing criticism of Israel as ‘antisemitism’”. The meaning of the term “anti/Semitism” has undergone dramatic change in recent years. It used to refer to hostility to Jews and Judaism. It has been redefined by some to mean criticism of Israel. In recent days, establishment Jewish organizations from the Anti-Defamation League (ADL) to the Simon Wiesenthal Center have called the BDS movement “anti-Semitic”—despite the fact that it is supported by groups such as Jewish Voice for Peace and such international groups as Jews for Palestinian Right of Return and the Israeli activist organization Boycott from Within. Jewish critics of Israel are as likely to be denounced as “anti-Semites” as non-Jews. For example, columnist Caroline Glick, writing in the International Jerusalem Post (Dec. 23-39, 2011) found New York Times columnist Thomas Friedman guilty of employing “traditional anti-Semitic slurs” and “of channeling long-standing anti-Semitic charges.” In a February 2012 Commentary article, Ben Cohen writes that, “The list of flagrant Jew-baiters is growing; those with Jewish names provide an additional frisson.” Among those he names are M.J. Rosenberg, a former employee of AIPAC. Mondoweiss editor Philip Weiss, New Yorker correspondent Seymour Hersh, and Time Magazine columnist Joe Klein. The redefinition of anti-Semitism to mean criticism of Israel is clearly an effort to end freedom of speech and discussion when it comes to Israel and its policies. It has nothing to do with real anti-Semitism, which this effort trivializes and which, fortunately, is in retreat. ** Abbas later apologized for and retracted his allegation that the rabbi had approved contaminating wells, which numerous media had compared to Medieval “blood libels” of Jews. The Western media and the antisemitism report did not mention the extensive evidence that Israeli settlers have contaminated wells and that the state of Israel did the same during the conquest of Palestine. The suggestion that evidence of human rights violations cannot be discussed if similar accusations have been unfairly made against other people at another time in history enables current violations to continue.